Targets Practice does make perfect–or at least as good as you can get. The best way to improve your marksmanship is through hours of practice on targets. Being able to consistently make the same accurate shots will help you both with your hunting and range shooting. 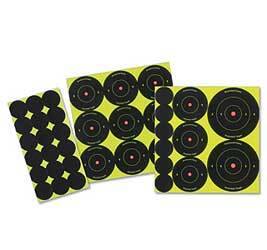 There are a wide range of targets available to choose from depending on what type of shooting you most commonly do. Targets are objects that you can aim at to improve your skill, whether it is with a rifle, pistol, or bow. They are a safe way to practice your abilities with something that can be evaluated to learn how to improve your aim. They come in a variety of sizes, shapes, and colors to challenge your shooting skillset in various ways. For law enforcement and home protection, silhouette targets are some of the best targets on the market. They can give you accurate ideas of where best to aim to prevent someone from causing harm to you and your family. For people who want to work on their skills on the range, a target with a bullseye can be the most beneficial to your needs. These targets are typically circular and have numerous circles on them for practice with more difficult shots. These are great for testing new scopes and increasing your accuracy with pistols. Some patterns can imitate different types of shooting competitions and can test speed as well as accuracy. For hunters, there are several animal-shaped targets that can help improve accuracy when hunting specific game. Once you purchase a firearm, is it a smart idea to train on it. Targets are by far the best way to become experienced with your new weapon. GrabAGun.com has a large selection of targets to meet the needs that you and your new weapon have.